I was only able to break away from work long enough to get to the Nexus Game Fair this year for one day but I had a blast! The convention was well-organized for me and I checked in and jumped headed straight to the miniatures wargaming hall to find guys from the Historical Miniatures Gaming Society like John Bobek, Kevin Cabai, and Steve Fratt, and get lots of pictures of their tables, and hopefully play in one of their tremendous games! 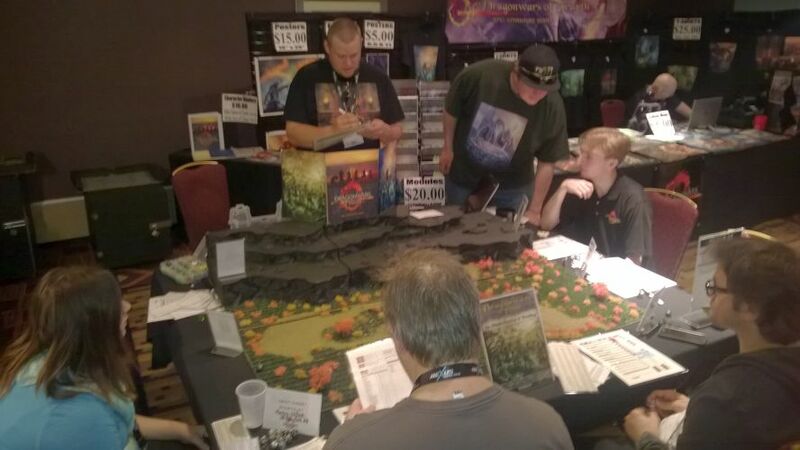 These are the sort of thing I only get the chance to do at conventions though I hope to coax one or two of them up from Illinois to run something at a future First Sunday event, or maybe on a different Sunday to better utilize the new Lake Geneva Games space. There was plenty of room for the open boardgaming at Nexus and the dealer area was attached right to it while the RPGers were on the lower deck. I took quite a few pictures and they can be found on Facebook here and Google Photos here.